Of a series: Part 1, Part 2. The code for this exercise is available on the WITH_GIF branch. One of the problems with doing automated UI testing in a CI environment is understanding failures. Today we are going to look at extending our Cucumber drivers to help with that. We are going to make a recording of what we are doing on the client side, and capture the log information from the client when there is a failure. Here we have created a method we can use to wrap a step with a generic beforeStep() and afterStep() method. We will need to get these invoked, but with Java 8+ closures, this is easy. We simply do a no args call in each of our step methods. Now, let's start by getting a screenshot and logs before and after each step. We will create a Recorder class with some static fields we will use to capture this information. 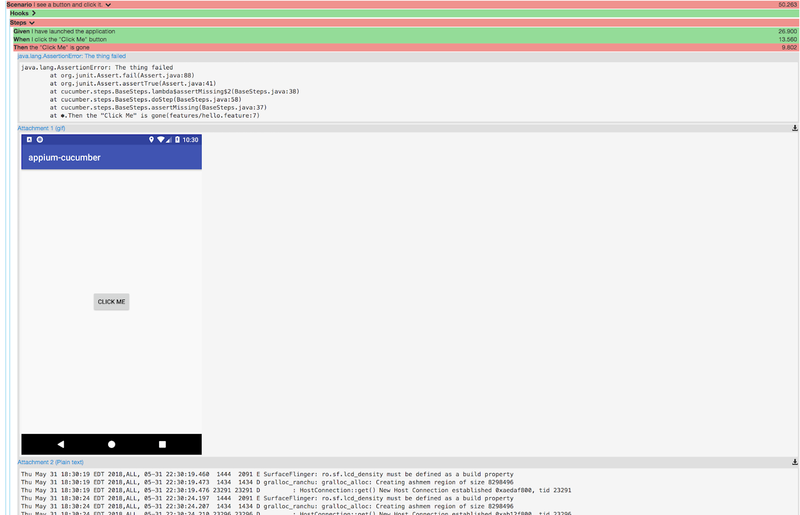 Since iOS has a few different log files, we need to merge them all together into a single sorted list. 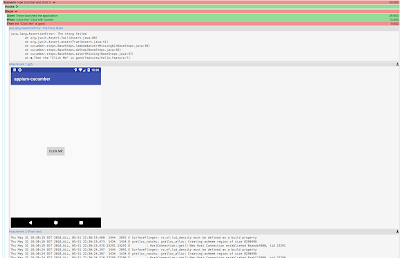 For Android, hey, "logcat" is probably what we want anyway. Each of the drivers will give us a screenshot to a temp file. Now, let's revisit the beforeStep() and afterStep() we created earlier, and capture all this information. So we get a screenshot before and after each step, and record the logs after each step. Now let's bring it all together and persist our information for failing Scenarios. We can do this by adding the @Before and @After hook annotations to our recorder class. This will create a new instance of the class, but we can still refer to the static variables. So in our @Before we initialize the static members. Then in the @After we finalize everything. If there are no images we can bounce. If there are, we will create an AnimatedGIFEncoder class and add all the images to it. I'm not going to get into the image processing thing, but you should pay attention to the last two methods of the finalize() method: by getting the Cucumber Scenario object passed into the method at the end, we can embed other data in the results by MIME type.